"Amigos" is our Monday Volleyball champion, taking down a number of tough opponents in the process. One of those opponents, "What's For Dinner? ", was undefeated before they two crossed paths. In fact they were a perfect 10-0 last season, winning a title in the process. But that didn't matter to "Amigos", who fought tooth and nail for every point they earned in the championship game. In that game "Amigos" got off to a great start with a 21-19 win in the first set before "What's For Dinner?" tied it up with a win in the 2nd set. The 3rd and final set was an incredible back and forth affair. Eventually though "Amigos" stepped up in the clutch, winning the set 23-22, and thus the match. 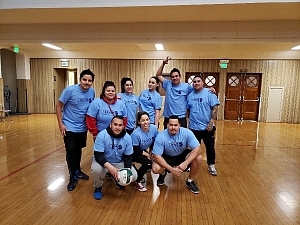 All season "Amigos" were one of the league's top teams, finishing with a 9-1 record. Their lone loss came to their eventual championship opponent near the end of the regular season. On paper it was a 3-0 loss, but only lost sets 1 and 2 by the exact same 21-19 scoreline. Being that close, they knew they could beat "What's For Dinner?" if they met them again. And that they did! Congratulations to "Amigos" on the incredible season!